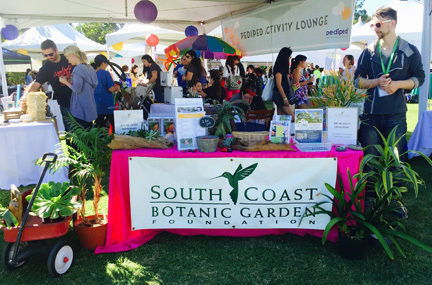 What a gorgeous day it for the Club MomMe Fall Family Fest held at the spectactular 87-acre South Coast Botanical Garden on the peninsula in Palos Verdes, California. The family-friendly event for moms, moms-to-be and their families was made possible thanks to generous sponsors ranging from major lifestyle companies such as Chicco, Diono, Bamboo Nature, Lansinoh, Whole Food Market, La Croix Water, Tieks, Baby Bjorn, Dolce Gusto to boutique brands that were equally engaging and fun to get to know. Special guests of honor included former Miss California Veena Crownholm, her hubbie and 5 year-old son and others. 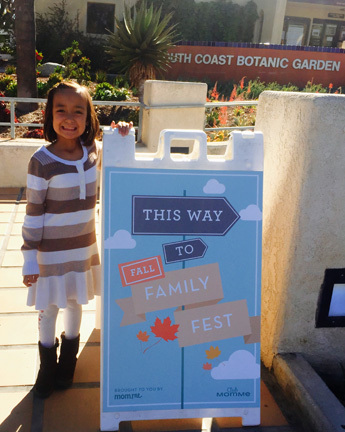 When I arrived with my hubbie and 5 year-old daughter, we were thrilled to discover that Fall Fest was methodically laid out on the upper meadow of this lovely botanic garden with 12 different stations and lounges. Before the event opened to the public, there was a special VIP and media brunch for us influencers and our loved ones. Not only were there many baby and family products on display for parents to touch, feel and try. There were truly areas for everyone in the family to enjoy: from the Lansinoh Feeding Nook for nursing moms, to a lounge for women to get pampered with complimentary manicures, mini facials, and blowouts. There was also the Baby Play Lounge, Kids Fun Zone play space for older children, and the DadDe Lounge man cave for the guys and for the first time this year, a new VIP lounge with special treats to enjoy. 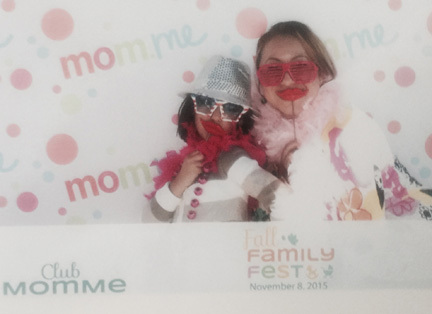 There was also a super fun photo booth where we took the mommy and me picture you see here, live musical entertainment and guest speakers talking on all kinds of topics of interest to parents. 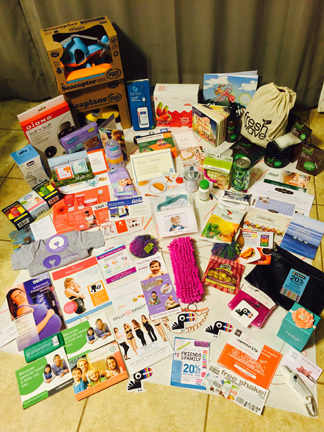 To add to all the fun for us bloggers there was even a social media scavenger hunt with lots of great prizes to win. This was Southern California at its best, with the weather playing a great role as the temperature was simply perfect that day. This was a working event for us bloggers. However, we were still encouraged to enjoy ourselves as well as bring along our families, hubbies and significant others, kids, and even grandparents. This turned out to be a really wonderful idea because Club MomMe had thought of everything, down to the last detail to be sure everyone had a good time. With even the smallest guests in mind, Urbansitter gifted each family with a $50 credit to provide childcare for the kids. This freed up mom and dad to explore all the activities geared to parenting and just plain relaxing. While there, courtesy of The Tot Squad, attendees were also treated to free thorough cleanings of their non-so-clean baby car seats, strollers, etc. As you can see from the photo below, the press goody bag was amazing. Stay tuned for future posts in the months ahead as I review my favorite Fall Family Fest brands. Snacks and drinks were on hand for everyone to enjoy throughout the day. There were also plenty of toys and entertainment to keep the little ones from getting bored. While us moms were pampered with manicures and beauty tips the dads were treated to their own pampering area complete with food, drinks and a big screen plasma HD TV to help them chill and just hang out. 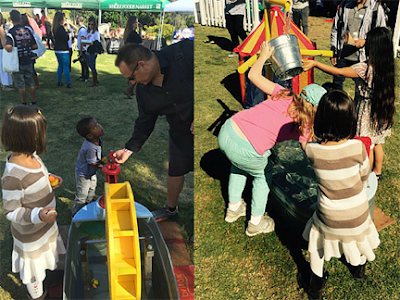 Family Fest was without a doubt a day full of fun for everyone from babies to adults. FTC Disclosure: This is a sponsored post. 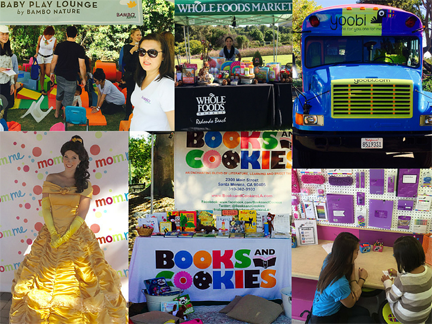 MBE blogger Norma Perez and her family were invited to cover Fall Family, received a variety of services at the event and a goody bag as a thank you for attending. However opinions in this post are Norma's alone. See complete FTC Disclosure information that appears at the bottom of MommyBlogExpert's main page and at the bottom of every individual post on this blog, including this one. Family Fest sounds like a great time.I know my kids would love it. Looks like you guys had a great time. It seems like a great bonding experience. Oh how fun. My 5 year old would have LOVED to meet Aurora. And I definitely appreciate family friendly events that offer nursing areas for new moms. This looks like it was such fun. I would love to attend an event like this. You have to love being pampered too. 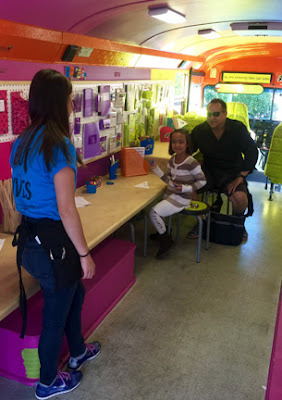 It looks like this was such a fun event to spend the day! I need some bonding time with my kids! This sounds like a great event. Wish I could have been there. 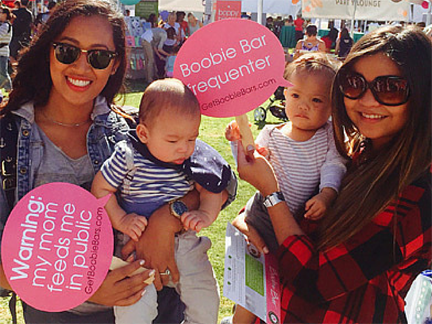 What a great event, looks like something every new mom should be able to get a lot out of. Looks like you had a ton of fun. There is a lot of fun stuff going on there. I miss outings like this with my daughter (she is now a young teenager). Our family adventurers are changing but we still have a great time! Family Fest sound as a great event, This is Fun and enjoy way to have a bonding with the kiddos. Wow, 87-acres of Botanical Gardens!? I would be in heaven. Looks like it was an amazing time. looks like you guys had an amazing times. thanks so much for the share. Events like this are so special. And your exposure to new things helps all of us understand if we'd like them too. The information on Urbansitter alone makes a big impact. What a fun day to spend with family. Events like these are so exciting. It sounds like a fun event and I love there was a lounge for nursing moms and also a place for manis and pedis. I would love to have one of each right now. Sound like a great day and that every details was thought of. How great that you were able to do this with your family. The $50 child care gift card is pretty cool.